The Lagos State Commissioner for Health, Dr. Jide Idris has announced that there is renewed commitment by the present administration to ensure improved and quality healthcare for Lagos residents, explaining that activities in the sector will be geared to reflect the mantra of change the government of the day. Speaking Tuesday at a media parley held at the Conference Room of the Ministry, Idris noted that measures are being taken by the administration to ensure the realisation of this objective. The Lagos Health Ministry boss stressed that the challenges in the health sector may seem insurmountable, but the administration of Governor Ambode is committed to solving the problems step by step and systematically. Idris further said that this administration would focus on attitudinal change among health workers, amongst other issues to be addressed in order to achieve effective and qualitative service delivery to the general populace. According to him, it will no longer be business as usual as the Ministry will no longer tolerate any act of indiscipline and is ready to mete out sanctions to erring workers and show impenitent ones among them the way out. The Commissioner said that the State would train and retrain its health workforce to empower them order to deliver qualitative service to the teeming populace. According to him, the administration has procured power generating sets, ambulances and portable x-ray machines for distribution to public hospitals, among other laudable achievements. He also said that, Ayinke House project which was abandoned by the former contractor had been re-awarded to another contractor that is ready to deliver the project in record time of 12 months contrary to speculation that the project has been abandoned. He said: “The contractors handling the renovation messed it up. They had internal problems and they could not meet with the completion date of the project. The former administration even tried to help them yet they failed so we had to terminate the contract. As we speak, we are incurring demurrage on the equipment we imported for use in the facility. However, we have re-awarded the project to another contractor who has promised to complete it soon. Idris debunked the rumours that the State has also abandoned her plan to establish a medical park, but rather with modification of establishing it at the old Nursing School, Awolowo Road, Ikoyi in Lagos. The Commissioner said that a technical team was already studying the medical insurance scheme with a view to implementing it in public hospitals. On the seemingly industrial health crisis in the State, Idris stated that a new synergy with the Lagos State Health Workforce has been developed which is already yielding fruitful results. This story was published in Newswatch Times on December 24, 2015. 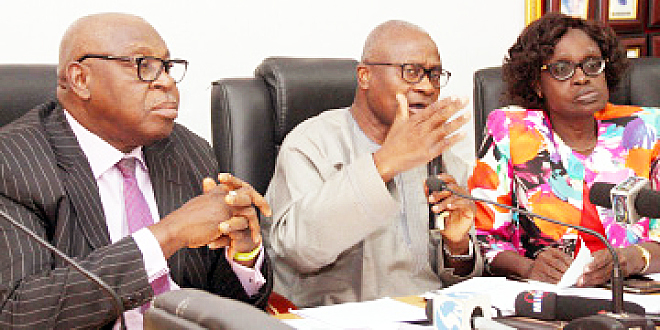 Having been certified by World Health Organisation(WHO) since September 2014 for Good Manufacturing Practice (GMP), May& Baker PharmCentre said weekend that it would soon announce the first set of Nigerian internationally prequalified products. Declaring this weekend, was the Managing Director/Chief Executive of May & Baker Nigeria Plc, Mr. Nnamdi Okafor, at the company’s end of year media parley held to appreciate the commitment of the media, especially in partnership with his organisation, even as he said that they fulfilled financial returns of the company in 2015 compared to 2014. However, the Chief Executive, while highlighting the feat attained by May & Baker Nigeria Plc in the year under review declared: “We leveraged on our investment in our world-class pharmaceutical manufacturing facility to grow turnover and profit, despite the challenging business environment in the country. The facility is fast growing into a hub of pharmaceutical manufacturing in West Africa with a remarkable level of capacity utilization and efficiency. “As the usage of the capacity of the factory grows, costs are now being optimized and the factory is daily getting to run more efficiently and more cost effectively,” he said. Beyond the above feats, the chief executive of M&B confidently assures the shareholders of the company to always expect improved performance every year. “In the new dispensation, as world class operators, we are taking steps to build a new class of human capital through training, reorientation and motivational schemes. The underlying success factors to our new orientation are people, performance, productivity, and of course, adequate returns on investments,” he assured. Outlining some of the challenges of the Nigerian Pharma industry, Okafor pointed at the infrastructure, saying that the cost of doing business in Nigeria is very high especially on the area of power generation. While responding on the issue of New National Drug Distribution Guidelines, he said the whole idea is to ensure that drug distribution in Nigeria is done the way it is done all over the world. “The only way we disagreed is how they were going to do it because they were going to have a few meager distributors. We know that those guys don’t have enough resources and capital, and therefore it was going to be a recipe for disaster and we blocked it. And government has acceded to the industry’s decision,” he explained. While reacting on the government’s response to their demands in the adjustment of Common External Tariff, he said such tariff is abnormal in the sense that it’s making the drugs production in Nigeria to be more expensive. “At a time the government is facing a lot challenges such as creating jobs, foreign earnings dropping and also struggling to keep naira value, it does not make sense to encourage that. So we believe it was an oversight. It is something that has to do with ECOWAS, it is taking time to be corrected,” he said. The Managing Director, noting that 2015 is yet roll by, said: “We are not yet in a position to give figures of our financial results for the outgoing year, as we still have two weeks to do business, after which the accountants and auditors will need to put the figures together. However, I can say that the first three quarters of the year pointed to very positive signals of where we shall be at full year. “In the nine months of 2015, we achieved nine per cent growth in turnover and 165 per cent growth in profit before tax when compared with the same period in 2014. 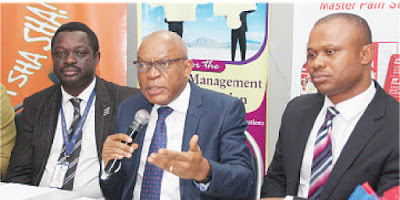 We had a turnover of N5.3 billion and N60.63 million profit for the period, compared to a revenue of N4.8 billion and loss of N93.5 million for the same period in 2014,” the MD said. He however acknowledged that their profit after tax also grew by 144 per cent to a net position of N41 million from loss of N93 million in 2014. “We have kept our operating and admin expenses well below revenue and inflation growth rates. We also contained our main headache, finance charges, reducing it by 8.7 per cent from N466 million in 2014 to N425 million same periods in 2015,” he stated. 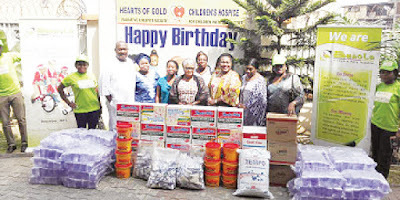 As a show of love and in the spirit of sharing, a non-profit organisation, Benola, A Cerebral Palsy Initiative, has donated relief materials consisting of food items and toiletries to Hearts of Gold (HOG) Children’s Hospice. Making the presentation weekend, Femi Gbadebo, Founder/CEO, Benola, A Cerebral Palsy Initiative, who led the delegates to HOG Children’s Hospice at Plot 75 Alhaji Masha Road, Onilegogoro, Surulere, Lagos state, explained that Benola’s visit was part of his organisation’s Christmas outreach efforts to identify with indigent children who are living with disabilities. Gbadebo expressed optimism that the items given to them would go a long way in helping the beneficiaries as well as experience the warmth and sharing identifiable with the Yuletide season. Newswatch Times reports that the organisation, founded and co-founded by Gbadebo and his wife, Alaba, is committed to change and progress for persons living with Cerebral Palsy. Their mission is to strive for their inclusion into society in order to ensure that they and those who care for them live the best possible life under the peculiar circumstances in which they find themselves. According to Benola CEO, the visit to HOG which was the second time in the year, was targeted to fulfill his organisation’s mission to improve lives of people with disabilities. Gbadebo who further said that the visit was quite fulfilling added that Benola look forward to more interactions with Hearts of Gold in the near future. Responding, Mrs. Laja Adedoyin, the Founder, visibly excited that Benola was visiting the home for the second time in the year while conducting the team round the hostels to see amazing array of children with very unique malformations, thanked them. Hearts of Gold or HOG as it is popularly known has been in existence since 2003 and remains the first and only children’s hospice in Nigeria that caters to the increasing number of abandoned and orphaned children aged between six months to 13 years who are suffering from a vast range of severe congenital, physical and mental disabilities. For children with terminal and other life-limiting and life-threatening illnesses the hospice offers comfortable, caring and loving environment. They also provide palliative and respite care services.